The benchmark price of iron ore on Monday soared 4%, erasing steep losses earlier in March that saw the steelmaking raw material take a dramatic fall to near 18-month lows. According to data from the The Steel Index, the import price of 62% iron ore fines at China's Tianjin port added $4.50 to $116.80 per tonne, a three-week high. It was the best one day performance for iron ore since early August and a welcome turnaround in sentiment compared to the 8% drop in a single day to $104.70 on March 10. The globe's most active steel future – Shanghai rebar – also jumped on Monday to around $540 as it recovers from record lows set earlier in the month. 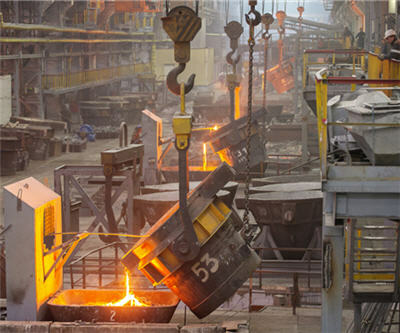 While China's steel output continues to moderate, easing back to 2.096 million tonnes a day according to the latest data from the China Iron and Steel Association, production is up from the 2.07 million tonnes daily average for last year. Expectations have been for a sharper slowdown in steel production as Chinese authorities clamp down on pollution in the industry by forcing closure of small steel mills and sintering plants. "Most of the announced closures to date have been for capacity already idled or curtailed for other reasons, with the lost production picked up by the larger steel plants. It is unlikely that we will see forced closures amongst the larger plants as this move will not reduce emissions significantly." So far this year Chinese imports have already jumped 21% compared to January-February 2013 and Wood Mackenzie forecasts China iron ore imports to reach new record high in 2014 rising 12% to 921 million tonnes compared to last year. UBS also has a sanguine note out on Monday about Chinese demand forecasting continued growth in imports. "We see short-term target price recovery unfolding back to >US$130/t cfr Nth China. Why? This level was regarded as ‘acceptable’, in 2013Q4’s more balanced trade."